One of the oldest (and most haunted) watering holes in New York City, the Ear Inn opened in 1817, and has maintained its status as a legendary neighborhood haunt for the living and the dead alike ever since. The Ear Inn’s door signage. Photo source. The bar’s building itself, the James Brown House, is a designated historic landmark. It was built around 1770 for James Brown. Brown was an African-American ex-slave and aide to George Washington in the Revolutionary War. Brown sought to retire in a quiet townhouse, and reportedly became a tobacco farmer. Little else is known of Brown, as detailed records of free slaves were not commonly kept. 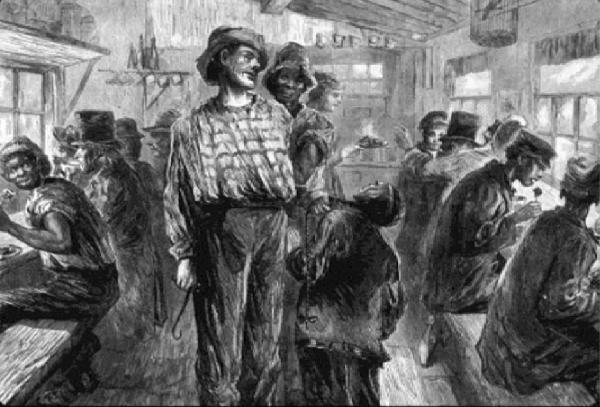 After Brown’s death, in the mid-1800s, the James Brown House began to transform into a waterfront drinking establishment, slinging homebrewed beer and whiskey to sailors coming in droves from the then-nearby (as in, five feet away) Hudson River. The sailors were also fed, for free, as long as they bought drinks, making the destination that much more appealing to the hungry, thirsty men. An 1800s illustration of the inn’s patronage. Photo source. By the next century, the establishment changed into a restaurant, but still maintained its boozy history. 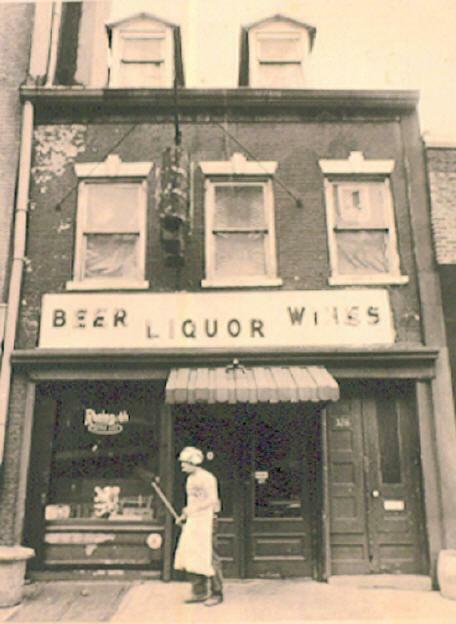 Not even Prohibition curbed the sale of alcohol, as the restaurant acted as a speakeasy. In the same building, the upstairs apartment has served as a smuggler’s den, brothel, doctor’s office, and boarding house, but the main level has unwaveringly been a hot spot for dining and drinking. The Ear Inn in 1973. Photo source. It wasn’t until the late 1970s that the “Door” finally became the Ear Inn. Current owners Martin Sheridan and Richard “Rip” Hayman cleverly altered the neon in the existing “BAR” signage to simply read “EAR.” The pair made this on-the-fly change, one of the precious few changes made to the New York City landmark since 1770, to avoid having to wait through bureaucratic red tape by the Landmark Commission to approve a formal change of signage. They also made this change in homage to the name of their music magazine, EAR, then produced upstairs in the same building. This quirky, defiant touch befits the legacy of the bar as a place for sailors, creatives, and travelers… of all planes of mortality. The Ear / bar neon sign. Photo source. 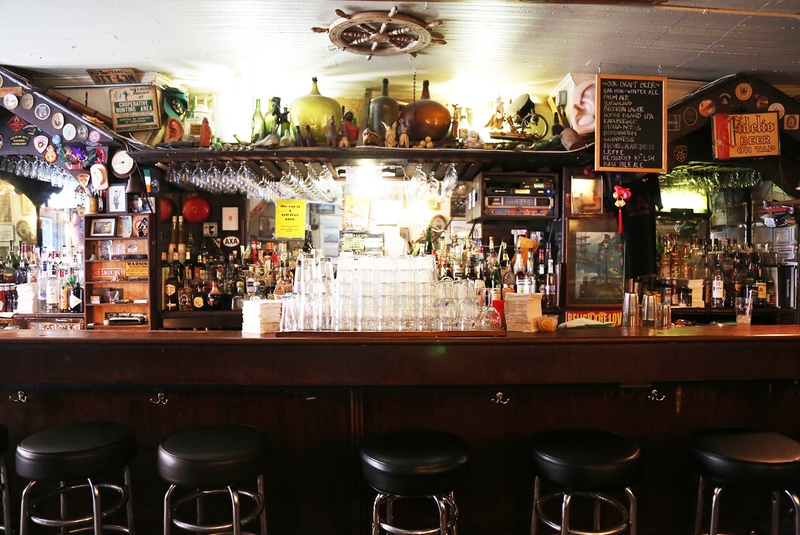 Once dubbed the “defining institution” of its neighborhood by Doug Cooper from The New York Times, no bar this idiosyncratic earns that reputation without a few ghost stories, and the Ear Inn doesn’t have just a few rumors of sightings, but at least one proper ghostly regular. One of the most established regulars, known as Mickey the Sailor, was a regular in his life, having spent the vast majority of his time and money at the bar when he wasn’t away at sea. He loved being at the Inn so much, it’s said, that he used to sometimes plead with bar staff to keep the place open after they’d shut down shop for the night. There is no clear answer on how Mickey sailed his last mortal voyage. One leading theory is that Mickey, after a long trip at sea, craved alcohol. After disembarking his ship, he dashed from port into the bar in a deranged froth, desperate for a drink of hard liquor. He got what he wanted, and more, as he drank, and drank, and drank until it poisoned him. It is believed, per this theory, that he died on the very place he sat, his bar stool, and that his spirit, undeterred by his cause-of-death, has been an ongoing patron ever since. The other leading theory on Mickey’s death states that Mickey wasn’t away at sea, but right at his home-away-from-home, the Ear Inn, in 1920. He had a normal night, per his habits, of heavy drinking, but then decided to go to his real home. As he drunkenly sauntered out of the bar, his walk was cut short. He was struck by a car in the midst of crossing the street, and shortly died from his injuries. Given this account, it is possible that his spirit took perpetual refuge in the bar, as it was the last safe place his mortal form knew before his sudden death. After his death, Mickey’s love of the Ear Inn is as strong as ever, albeit even more debauched, as if he’s been emboldened by crossing over. As a ghost, he’s developed a preference for a particular style of supernatural teasing and torment. He doesn’t wail and spook bar patrons like the average ghoul, or seek to drive visitors into spirals of shock and fear with grotesque projections. Instead, he prods at waitresses, making them squirm and shriek all the same from his literally cold, presumptuous advances. Female guests who’ve dared to stay upstairs overnight have also complained that Mickey has cheekily snuck into bed with them, seeking to cozy up with the warmth from the (feminine) living. In addition to his lustful pursuits, Mickey also has, in stereotypical sailor fashion, a penchant for casually stealing swigs from patrons’ drinks. All too commonly, one moment, a bargoer orders a drink, brings it from the bar, and sets their drink down at their table. The next moment, their drink is mysteriously quaffed, leaving them with both a dry glass and deep, deep confusion. Because of Mickey’s meddling, arguments tend to break out among bar visitors, as they believe one of their friends must’ve downed the drink when they weren’t looking, or that the bartenders are playing some sort of trick or illusion on them. For years, the ownership has remained firm that, no, their employees are not magicians or pranksters; that’s simply Mickey being Mickey. It’s possible that Mickey acts out like this because he’s merely bored, but who wouldn’t be if you’ve had to wait for over a century for your ship to come back into the harbor? The bar at the Ear Inn. Photo source. Whether or not this “strange man” was also Mickey remains unknown. After all, it is only partially befitting of his behavior—Mickey would’ve gotten into bed with them—but there are anecdotal reports of other otherworldly patrons at the Inn besides the storied sailor. Other ghosts said to dwell at the bar are described, varyingly, as former patrons who, like Mickey, died from drinking excessively; sailors who also adored the bar so much, they’ve still not decided to leave, and courtesans caught between worlds. No matter who you may run into at the Ear Inn, you’re sure to have a night to remember at this irreverent dive, and come out with your own stories to tell… if perhaps also a little more watchful of your drinks, and of ghostly sailors and their wandering hands. 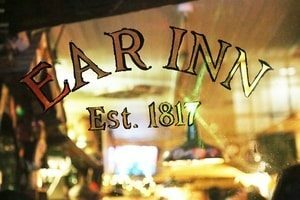 If you’d like to meet Mickey yourself, the Ear Inn is a short walk from Greenwich Village, and accordingly, the route of our entrancing New York City Ghosts tour. On our tour, you can encounter more paranormal personalities… including even more (in)famous spirits than Mickey the Sailor. Bardo, Michael. “The 5 Most Haunted Places in New York City.” UrbanMatter, Urban Matter, 2 Oct. 2017, urbanmatter.com/new-york/haunted-nyc/. Farley, David, and Steven Casale. 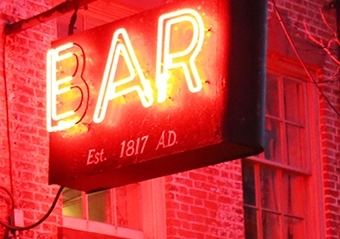 “America’s Most Haunted Bars and Restaurants.” Travel + Leisure, Meredith Corporation Travel & Leisure Group, 16 Oct. 2015, www.travelandleisure.com/slideshows/americas-most-haunted-bars-and-restaurants#1. “History.” The Ear Inn, The Ear Inn, www.earinn.com/about/. Huguenin, Patrick. “At NYC’s Haunted Bars, the after-Party Never Ends – NY Daily News.” Nydailynews.com, New York Daily News, 30 Oct. 2007, www.nydailynews.com/life-style/eats/nyc-haunted-bars-after-party-ends-article-1.232127. James Brown House: History and Highlights from the Book, www.jamesbrownhouse.com/history.htm. “James Brown House: Said About the Ear Inn.” James Brown House: History and Highlights from the Book, www.jamesbrownhouse.com/saidaboutear.htm. “New York’s Ear Inn Frequently Visited by Drunken Ghost.” Backpackerverse, Backpackerverse, 25 May 2017, backpackerverse.com/new-york-ear-inn-ghost/. Siegel, Allison B. “Haunted History: Ghosts on the Shore of the Ear Inn.” Bowery Boogie, Bowery Boogie, 30 Oct. 2015, www.boweryboogie.com/2015/10/ear-inn-please-tell-us-see-ghosts/.